Zach had a 14-year NFL career, 12 of those seasons with the Dolphins (one with Dallas, one with Kansas City). During his illustrious career he was named to 7 Pro Bowls, was named first team All-Pro five times and was named to the NFL’s All decade team of the 2000s. 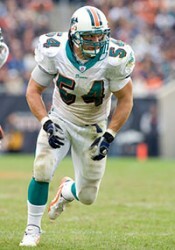 Zach has more tackles (almost 1800) than any linebacker currently in the Pro Football Hall of Fame, and ranks fourth all-time in tackles among linebackers. He is one of only three players in NFL history to record 100+ tackles in each of his first 10 seasons. He also intercepted 17 passes and recorded 20 sacks during his career.